This is the final article in a 4 part series where we’ve been discussing how to choose between ALL the hardwood floor finishes out there. This is obviously an issue with many people because I’ve had quite a few messages about when this final article to the series would be ready… sorry for the delay over the holidays and thank you for your patience. In last article we compared all of the finish systems side-by-side and ended up choosing the 3 best by process of elimination. But that still leaves the field pretty wide open as there are many different brands and products among those three groups. In this article we will talk about the good and bad points of these 3 finish systems and reveal our recommendations for what we feel are the current top finishes in each category from our hands on, real world experience. As we talked about at the start of this series of articles, high-end water based finish systems are on the cutting edge of technology and are among the most durable finishes available. But Iet’s go through the minor drawbacks of these finishes so you have the full picture. One downside to water based finishes, if you have oak floors, is the color. If you just apply a clear water base finish to red or white oak it looks terrible. It’s dull, flat and lifeless. So… your floor will need to be stained first — either natural or in a color of your choice. Another downside is the price. These are among the most expensive finishes. Our wholesale price for a gallon of high-end finish is in the triple digits—compared to say maybe $30.00 for cheap “handyman” finish. They’re also far more challenging to apply because of their extremely fast drying times. This means if your finisher isn’t an expert at applying them and he messes a coat up, the entire floor will have to be re-sanded (meaning more flooring removed) and the finish reapplied from scratch. Like we’ve already discussed, these high-end finishes are very durable, they provides a very nice build layer and they’re very easy to clean and look after. Another huge benefit they have is they don’t have the horrible fumes all the other solvent and oil based finishes have (although the stain and sealer will have a slight odor to them if they’re used). They also have built in UV inhibitors, so they won’t change color anywhere near as quickly as the oil based finishes. After years of testing dozens of professional quality finish systems we have decided on a product from a German company called Loba. We’ve been using Loba for more than a year now and have completed close to 100 projects with their waterbased finish systems in the last 12 months. The single component finish we use and recommend to our clients is called Loba Easy. We’re convinced this is the best single component water based finish on the market today. If you’re looking for a finish with amazing durability, great looks, very low VOC’s and is easy to clean and take care of, then this system is going to be an excellent investment for your floors. If you want the best of the best in surface finishes, this is it. It’s called 2 component because it’s made of two parts — the finish and a catalyst. The catalyst is an industrial grade hardener and when it’s mixed into the finish, the chemicals blend and mix to form an extremely tough and extremely durable and scratch resistant floor system when it’s dry and cured. This is the finish we use for our commercial projects like retail stores, hotel lobbies, dance floors, cafes and restaurants. We also offer this system to homeowners that want the absolute best surface finish system they can invest in for their home. If you have a high traffic home with lots of dogs or children, or you’re always walking across your wood floors with your dirty shoes, then you might want to consider this commercial grade option. You may also want to look into investing in this finish system if you have old antique hardwood floors that have been sanded and refinished many times before and now don’t have a lot of wood left to sand. In this case you will want to protect what flooring you have left with the best finish available. The downside to this finish system—expect to pay around 30% more compared to other finish systems. After considerable time and expense spent testing of dozens of two component finishes we have decided on a product from the same German company—Loba. The finish is called Loba Supra. This is as good as you can get if you’re looking for a surface finish that looks great, is low in VOC’s, is incredibly durable, won’t yellow and is easy to clean and maintain. These relatively new finishes have been a big welcoming surprise to us over the last few years. As you can see from the Finish Comparison chart in Part 3 their overall score comes in second only to the 2 component water based finishes. Like the other two finish systems we recommend, these finishes are highly water resistant, very durable and they’re easy to look after and maintain. They have a lot of things going for them over conventional surface finishes. For one thing, they are the most “green” and environmentally friendly finishes available at the moment. One that we use and recommend has zero VOC’s! The highest one is 50g/liter — compared to oil based finishes that are around 500g/liter and Glitsa that has 725g/liter! That means no more being driven out of your home for days on end by strong fumes and toxic chemicals. Because hardwax oils don’t form a plastic film that sits on top of the floor surface, it makes them far easier to spot repair than surface finishes if you ever do any damage to them. You can repair the damage in the middle of a room and it will be virtually impossible to see if you didn’t know it was there. To do the same with a surface finish we would need to re-coat the entire area so we could ensure that the new finish and sheen blends in properly. These finishes can be used in domestic as well as high traffic commercial applications. In fact they’re becoming very popular in commercial projects because they dry fast and don’t stink up the whole building. With certain systems (particularly Rubio Monocoat), the custom colors and mixes you can achieve is incredible. If you want something completely out of the ordinary and unique then you’ll definitely want to consider this option. The downsides — if you love super glossy finishes then hardwax oils won’t make the cut. The highest gloss level they can attain is a subtle satin sheen, and that is only specific products. But most people that choose hardwax oils love them for their hand-rubbed matte, natural wood look. And unlike high quality surface finish systems, hardwax oil finishes need to be properly maintained and refreshed several times throughout their life to maintain their protective coating. But this is a good thing too because if you stay on top of the maintenance schedule you potentially will never have to sand your floors again. Just keep looking after them, spot repair damaged areas, do the proper maintenance coats and the finish should last a very long time — as long as you still take good care of the actual wood and don’t gouge, chip and dent your floors. After years of testing all the leading hardwax oil finishes we have decided to offer 2 options (depending on the look, color and sheen you are hoping for) — Rubio Monocoat (our #1 choice) followed by Pallmann Magic Oil. Hardwax oils have definitely added viable options to the hardwood finish mix. If you’re open to a non-conventional finish approach, appreciate the many benefits they offer and can live with the minor downsides, then one of the two hardwax oil systems above could be perfect for your home. So there you have it. Hopefully this series of articles has helped educate you on the basics of hardwood floor finishes and has shown you a clear choice as to what finish system you’d like to invest in for your hardwood floors. If you have any other questions pertaining to hardwood floor finish systems or you would like to see samples of our recommended finishes in person, please feel free to call us and ask. We’re always happy to help. Do you consider Waterlox tung oil a hardwax finish? What do you think of it? During my 3 month search for wide plank flooring, I saw a sample where the wood had been sealed before the hard wax was applied. It did not increase the shine but enhanced the color and graining in a way hard wax or conventional finishes don’t. The wood was singing when others only hum. comment? No Waterlox is not classified as a hardwax oil finish. We have used it in the past but don’t particularly like it. It smells extremely bad, is too glossy (compared to low sheen hardwax oils) and ambers the wood too much. There are people that love it though. As far as sealing and using a hardwax oil on the sample floor you saw – do you know what the product was? Hi, all the wood in my home is stained golden oak. I’m talking cabinets, trim and oak railings. We are planning on installing hardwood floors one room at a time and would like to go darker. We are also replacing windows. What do u think of provincial? And since we are completing projects piece meal do u think it will look o.k. to have provincial windows with oak cabinets and railings or should the windows stay golden oak and only have the provincial (darker) color on the floor. I would really appreciate your opinion. Yes Provincial is a nice color and will make your floors stand out against all of that Golden Oak. Personally I like the look of darker floors and windows being a more lighter/neutral color. This will open the room more… the darker things are above the floors the smaller the room will feel. Hope your big project goes well! Hardwood Flooring is definitely gives great value to our homes. Easy of maintenance is its best quality. Thanks for sharing…. Thank you so much for doing the tests and so generously sharing your results in blogs. Since you now use Loba products, do you have any experience with Loba Supra AT? I want the most durable finish for a kitchen floor that will have water, food, and chemicals accidentally spilled on it. Did you like the higher VOC oil based finishes better than the 2 component water base ones before they were banned? We haven’t used Supra AT on a project yet but we have been experimenting with it. Yes it is a very good finish and would do well for where you want to use it. To answer your second question, at the time we liked the look of the old oil base finishes. They had a nice amber color, a deep, thick build and were relatively easy to apply. We didn’t like the smell or fumes though. Water based finishes had some challenges when they first came out but they have come a very long way in the past 10 years and we would never go back to oil based urethanes even if we had a choice. I wish you wanted to take a road trip to SC because I would hire you in instant. Love the information you have provided, as it has helped me immensely. Most of your displayed work and comparisons are on oak or very hard wood. I built a log home myself 15 years ago, and I installed heart pine floors throughout the entire home, including kitchens and bathrooms. When I installed these I put min wax stain and several coats of polyurethane. Considering 3 boys, dogs, and the fact it is a working farm, the floor has seen its share of wear. I’m getting ready to sand and refinish my floors and really want to use a hardwax oil. Currently thinking the Pallmann Magic Oil and wanted to know your thoughts? Is this a good choice? If I wanted to darken it slightly with a stain prior to application what type would you recommend? How long should the stain dry before the oil? Any advice you can provide would be greatly appreciated. Your floors sound very nice! Yes Pallmann Magic Oil is a great finish and we highly recommend it. It would look great on those floors. We have used Duraseal and Minwax stains so you should have no trouble with either of those. Just follow the data sheet for drying instructions according to your climate. The best way to deal with it would be to get in contact with a water damage restoration company. They have the specialized equipment needed to deal with this situation. Unfortunately a fan blowing hot air won’t cut it. Hope you can get it sorted soon. Unfortunately we don’t deal with fir here in the greater Chicago area so I couldn’t give an expert opinion on that sorry. I would contact a floor refinisher in Washington state as they have a lot of fir floors over there and are at the forefront of hardwax oil finishes. But like you, I do wish it was available too. Thank you so much for all your great info, testing and pictures you have so kindly shared here. I live in Oregon so i unfortunately cant hire you here to refinish our floors. My loss! I am thinking of using Rubio for our kitchen, dining room, living room, entry way and bathroom. We have an experienced refinisher lined up to do the job who has never used the product. Our floors in the various rooms are white oak, black oak and maple. 1) What is your experience of the durability of Rubio in water prone areas like kitchen and bath? 3)Is it absolutely necessary to use Rubios raw wood cleaner (one of their brochures say for exotic woods)? 4) Does Rubios fumed and smoke only work for white oak? Our black oak and white oak areas are in open and ajoining areas. I hope you have the time and are able to answer soon as I can not seem to get many solid answers from Rubio. 1) Rubio is very durable and we have found it is not too sensitive for wet environments like kitchens and baths. The finish does have to be applied properly according to the instructions 100% and then let cure completely. I recommend to water pop the floor first before application of the finish. I believe that makes the finish more durable. Make sure all excess is removed too. 2) Yes, every type of wood will show a different result with the same color. Color testing first on small area of floor is a must. 3) We don’t use raw wood cleaner on oak or maple, but they say it must be used on exotics. 4) Again testing is a must. White oak reacts more then red oak, but I don’t know about black oak unfortunately. Hello, Tadas! THANK YOU for your detailed and easy to understand guide for choosing a hardwood floor finish! As all the others mentioned above, I wish you were in the NYC area so I could hire you for my home project! We currently ripped up carpet in our 2 kids’ bedrooms and the hallway, exposing red oak floors that I’d like to stain grey. The professional we hired told us to pick a water-based stain from Minwax, but their “charcoal grey” reads blue to me. In your opinion, can red oak be stained grey? and If so, which one would you recommend? While I am located far away, I would be happy to refer you clients should the occasion arise. I am trying to decide between Rubio Monocoat vs. Pallman’s Magic Oil, with no stain. I have 5,000 square feet of new unfinished walnut flooring (wide plank character grade with some small knots). My flooring person has never used either system, although they are otherwise experienced in flooring. Which system would you recommend for a first timer? With 2 small children and a dog, any durability comments? Thanks in advance. I apologize for overlooking your post. For a first timer I think Rubio Monocoat would be easier. Just don’t mix too much product at once as it could harden before you get the hang of it and finish the floor. Mix just enough to do a small section at a time and then there will be much less pressure. Someone there should be able to help. Thanks so much for explaining the differences between a couple of the best finishes you feel are available for hardwood floors. I have approx. 1,800sf of Brazilian cherry hardwood floors and have been getting estimates. I am from the Kansas City area and wish you were too! Lots of confusing information out there! I’m leaning towards the Loba Supra as this is what the company I am leaning towards uses. The hardwoods are on a the first floor which is high traffic so sounds like it will in fact, be the most durable…do you agree? Regarding the stain, I love the grain in the floors but would really like to tone down the red, any brilliant ideas? Also, based on the type of wood I have should I look for a company that uses the hardwax oil finishes? Sounds like a good choice for the type of floors you have, Brazilian Cherry is beautiful and water based finishes work extremely well with them. That would be my preference. As far as toning down the red… give it a couple of years and they will darken naturally. I am finishing my first floor with Rubio Monocoat and would like to know your recommendation to increase the sheen of finish from matte to satin. I am experimenting with the Monocoat Universal Maintenance Oil and the satin soap but have no experience. Can you tell me what you would recommend and how best to apply it? Thanks for your help. Chip M. BTW – I found your Blog very helpful! I have a question about using the newer, water-based finishes when you are trying to match the appearance of an older oil-based poly. If it is going over a stained oak floor, will the top-coats’ appearances be noticeably different from one another? The reason I am asking is that I need to refinish our prefinished oak flooring and we would like it to reasonably match the newer oak treads we put on our stairway about 6 years ago. We had the oak on the stairs stained a “gunstock” color and finished with 3 coats of a satin/semi-gloss oil-based poly. The prefinished oak flooring on the first floor was a natural color, but we figured that we would just have it stained gunstock to match the stairs when it came time to refinish it so it would eventually match! However, it sounds like, from what you have explained, that the quality of the oil-based polys has really gone down since we originally did the stairs. So, if we refinish our floors with a gunstock stain and then a water based finish will it be very noticeably different? (BTW, our prefinished flooring is by Bruce, and is a “natural” red oak strip with square edges (no bevels at all) and a low gloss finish. It was done over time: the earliest was installed in 2002, then about 2006 and then 2010. The older flooring is showing some wear and needs to be refinished.) Thanks for any recommendations you can give! Thank you for the compliments… you’re more than welcome. To answer your question, yes there will be a difference between the look between waterbased and oil based finishes. One is a clear coating and the other has an amber hue due to the oil in it. You should be able to match the sheens pretty closely though so that won’t be a concern. If you get the color of the stain right, then it shouldn’t pose too much of an issue. Your stairs may be a different grading of wood, and if so they will look a little different anyways. If we were doing it, we would make a sample close to the stairs to get as close a match as possible. Things like a small percentage of neutral stain added to the original color, or a percentage of a darker stain added, can make up the difference. As can water popping the floor. A good floor refinisher will be able to work with you on this. I would say go for a good quality high-end finish for your floors so they last a long time, and match them as best you can to the stairs. Its a better option than using a lower quality finish and still not having a perfect match. Hope that helps a bit Phyllis. You are obviously an expert in the industry which is evident by your detailed and educated blog articles and comments. We recently refinished our red oak floors with a duraseal mix of true black and country white for what turned out to be a beautiful grey color. Where we went wrong is using the highly recommended Bona Traffic HD as our finish coat poly. We wanted to use the clearest and most durable water-based poly on the market and Bona was the number one recommended by many online professionals as well as our contractor. Unfortunately, as with all floors, we have gaps and in some areas slight movement. Well, this has caused the dreaded WLS throughout the house and in some areas the WLS has turned to peeling. We can’t be certain how much of it was caused by the product and how much due to contractor error. Regardless, our contractor has agreed to refinish the floors and we want to do it right this time and we are hoping you can give us some good advice. We are almost certainly not going to use a water-based poly again due to the fear of the elasticity causing the white line effect again in the gaps and eventually peeling. I have been researching oils and you seem to be the online expert of oil finishing. I love your reviews of the top three Rubio, Loba and Ciranova products. We plan on using the same stain and would like your advice on the finish. We are looking for exactly what you look for in a finish: Has to look good, long-lasting, durable to traffic and resistant to spills and relative easy maintenance and repair, non “yellow” excessively over time. Excellent article, excellent site, thanks for sharing your experience! For background, I have unfinished glued-on engineered wood with 4mm wear layer, that’s finished in-place natural. I am getting this stained to a dark tone (Jacobean or Jacobean+Ebony). Contractor says he will use DuraSeal for stain and finish. 1. Does water popping work on engineered wood (like mentioned above)? 2. Any experience you can share to help choose between the two-component DuraSeal and Loba Supra finish. 3. Contractor says he will do 2 coats of finish and one coat sealer, are they the same or sealer is different from finish. If different, what sealing product will go with above. 4. I am also getting stairs (including handrails & post) done along with this. Contractor tells me he will use lacquer finish (sprayed) for the stairs. But after reading on your sites of fire hazard with these product makes me really concerned. Do the two-component finish work on stair components? 5. Should the stair components be water popped as well to match tone? 2. DuraSeal is a great company. We use their stains almost every day. They have great professional high-end finish systems too. You can be assured their 2 component finish is good. 3. Sealer is different than finish. If he uses a professional and durable top coat you can rest easy knowing he will use a professional sealer that is compatible with the same system. Professional flooring contractors don’t want floors to fail anymore than clients do. Costs money to fix and no real professional would compromise a floor by using a cheap incompatible sealer. 4. I would have a chat to your contractor about your concerns. He should be able to answer all your questions. There are precautions you can take if using these products and you will need to decide with him if the risks are acceptable for the both of you. Yes you can use the 2 component finish but it will be a LOT more work and cost a lot more to do as it can’t be sprayed. It will come down to what finish you want, the VOC level you’re comfortable with and the big one – your budget. 5. This will depend on whether the stairs are the same type of wood as the floor and a few other factors. I’d have a chat with your contractor and tell him you’d like it to match as close as possible and see what he says. I’m sure he wants the same as his name will be attached to your floor. Hope that helps and your project goes well. I just found your blog and it has been such a tremendous help! I’m building a number of tables for a very high volume restaurant (1,600 people every Sunday!) and wondered what you’d recommend for a finish? Biggest concerns are water resistance, able to be cleaned well (occasionally with bleach), and scratch/abrasion resistance. I’d also love any opinions on application. I’m not currently set up to spray, but would it be a huge help? My guess is that a 2 part WB or pre-cat WB finish will be the way to go. Can I simply flood and use a t-bar? Get a synthetic pad or foam brush? It’s about 35 2′ x 2′ tables. Any help would be greatly appreciated – thanks so much! We know of restaurants that have used hardwax oils on tables, but not water-based finishes. My gut tells me (for all the abuse you described the tables will go through)to look into an epoxy resin. Search “epoxy table top resin” in Google and have a look at that option. I think it will last much longer with constant bleaching vs a polyurethane finish. Hi Tadas, I have some step treads in spotted gum and would like to use a water based polyurethane Loba product, can I spray this product? These products are designed to be applied with a roller, painters pad or t-bar. Hi Tadas, Thanks for the great info. We are planning on having our kitchen floor refinished but are concerned about the transition into the other rooms where the floors will not be refinished (they are in good shape). Is there a good way to closely match the floors? Is a two component product better for this? Any recommendations would be appreciated. 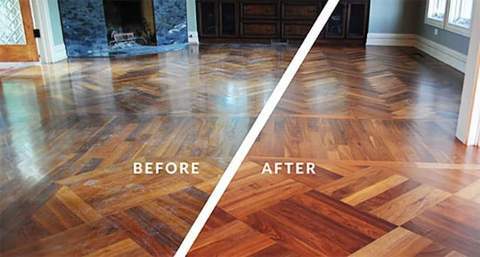 That is one of the toughest challenges in refinishing floors. If the color is very different it could be stained to match. You will need to take your time and go through a few samples to get a good match though. As far as finishes, whether it is a 2 component or single won’t matter as far as the color. What will effect it is if you put oil based on top it will amber the wood and make it darker. A water based finish will be clear and not change the color much in comparison. I came across your blog while researching floor finishes. It is very generous of you to share your time and expertise – much appreciated. We are replacing carpet with hardwood in our family room, dining room and hallway. I want a matte finish that will handle wear and tear. We will be getting a new puppy in the spring – most likely a lab, so a floor that can hold up to pets is needed. It would probably be a no-brainer to me to have oak floors installed and sanded and prepped with a hardwax oil finish, because I like what I have been reading about them. However, the idea of pre-finished flooring is preferable because finish-in-place would mean that we would not be able to use the living space at all for a period of time, and we would have to move ALL of the furniture out of the hose during this time. Are you familiar with any pre-finished flooring that uses the hardwax finish? The only one I have found so far is Stonewood products – they use the Rubio Monocoat. 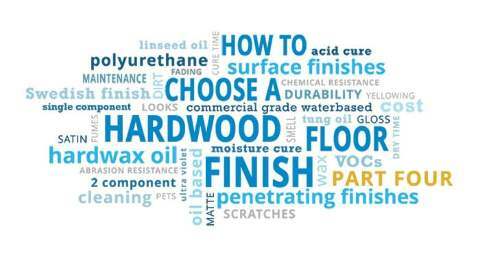 Would I expect to get all of the benefits of a finish-in-place floor with the hardwax oil finish using a pre-finished flooring system? Thanks in advance! Sounds like a good plan. Have a look at WD Flooring. They have some beautiful pre-finished lines that use hardwax oils. Hope you find something you love. Perhaps the local hardwood floor contractors aren’t as familiar with the higher end water-based polys? I had to rule out the hardwax oils because we are trying to match the existing stairs, which have a satin/semi-gloss oil- based poly from 2010 and they will not need to be refinished. Have any of the oil-based polys improved enough since you originally wrote this article that you would now recommend them? Thanks again, in advance! Sorry for the delay in replying. I’ve been on a bit of a break. No we haven’t had issues with white lines using Loba. It can be an issue with water based finishes though like you were told. I’m sure the quality floor guys in your area will know what works the best in your environment. I would definitely listen to them if all of them said the same thing. In certain parts of the country you can still get the higher VOC stuff in quarts, they will be able to tell you if that’s an option. They should be able to match the sheen for you too. Hope it goes well for you and you get what you want Phyllis. What do you think of Loba 2K? trying to decide between Loba Supra and Loba 2k – thoughts? Have 2 boys and potential for future dog. Many thanks for all the information you provide! Invaluable! It’s very durable and doesn’t show scratches easily because of the very low sheen. If you don’t want a lot of sheen then it could be perfect for boys and dogs. What are your thoughts on Duraseal Water Poly? Our flooring guy plans to use this product for our floors. Also, we have maple cabinets that look very orange/yellow. What color stain would you put on your floors to eliminate these colors? Not sure if that’s the one you’re looking at or the cheaper single component option. If I had a choice I’d go with the two component one in the link above. Hope the project goes well. I encountered your website while researching floor finishes.Thank you for all your information. I have a natural maple Mirage floor in my kitchen that is now 20 years old. Now that kid are grown, the floor needs to be sanded and refinished. The floor has become yellow and there are dents and scratches. The current floor sheen is semi gloss. Per your recommendation the Loba supra WB or AT is highly recommended. 1. Our kitchen is still a high traffic area, which product do you recommend? Supra AT or WB. I’m leaning toward AT as it seems to be more scratch resistant. 2. If my hardwood floor contractor has not used this line, will he be able to do properly? Difficult for a professional to do well? AT or WB easier to apply if never used the product? 3. Satin or semi-gloss? Maple without a sheen may be a bit blah. Can you mix satin and semi-gloss for a slight sheen? We have 3/4″ white oak in our home that is cupped, and just tested for up to 16% moisture content (we just bought the home so don’t know how long the cupping has been there or if it’s seasonal). We are in Georgia, so it’s hot and humid most of the time. We are looking to refinish the exiting floors and add matching site-finished white oak in the kitchen. We have toddlers. Would the Pallman’s Magic Oil be a good choice for us? Ps, our flooring contractor recommended Bona Traffic HD. I’m interested in your thoughts on that also. 16% is high. I would get that issue sorted out first. For finish, either system would work. Traffic HD is a great water based system. It’s very different to Magic Oil though so make sure you read up on the differences between them to see what would be the best for your family. Would you give me your thoughts on Loba’s hard wax oil, HS2K Impact Oil? I’ve been on the search for a Rubio-finished engineered floor to use over hydronic heat in our rehabbed farmhouse for several months. I just found (and fell in love with!) an absolutely beautiful 8″ European oak, but they like to use Loba. I can’t seem to find much info comparing the two, other than they’re both very low to “zero” voc and have low sheen. Which I also love. Do you know if the Loba is as easily spot-sanded and refinished as the Rubio? Does it wear as well? I want worn-looking floors, in fact I don’t want them to look new at all! But I also want to be able to apply new oil in areas that need freshening up a bit, like the kitchen. Any info you have will be greatly appreciated! Hi Lisa. We don’t have a lot of experience with this product just yet. We have used it, but not enough to recommend it fully. From initial testing and use, it looks really good. We use other Loba products and they are a very reputable brand. Sorry I couldn’t be of more specific help. Help. I am so lost when picking out a floor sealer for our new common #2 red oak wide plank floor. I’ve read bona traffic and traffic HD are amazing but they are very pricey. We need to go with waterborne for two reasons, allergies and time. I’ve also read that Glitsa MAxx is great too. I am just at a loss as to what to use. Also my flooring guy has only used waterbased finish 1 time in his 19+ years of flooring. Please lend me your advice. Thank you! Hi Devon. All of those finishes you mentioned are good quality professional products. If properly applied and cared for, either one will wear well. The only concern I have is your contractor who doesn’t have much experience with water-based finishes. They can be tricky to apply and you need to have a lot of speed as they are fast drying. That comes from experience. Make sure he is 100% qualified and comfortable doing this, otherwise it will need to be done over, costing you more time and money. Hello! I admire your work tremendously! I have a big question, and since you are experienced with Loba products, I hope you can help. Our installer does high end work and mainly uses Loba products. He recommended his usual combo for our job – which he said looks like ‘silk’ and everyone loves it. We had new red oak floors installed and existing red oak refinished. We thought the finish was going to be Loba Supra 2K Satin, but what was applied was 1) Loba Easy Prime, 2) Loba Easy Finish Semi Gloss, 3) Loba Supra 2K Semi Gloss. Anyway, in your opinion, would rebuffing and adding a final coat of Supra 2K Satin likely yield a uniform satin finish, or might it still be shiny because of the first 2 coats of semigloss? Might 4 layers (Easy Prime plus Easy Finish plus 2 coats of Supra) be too much, yielding a plastic coated look? Is there a time limit in which this should be done? In our case there will be at least a week and possibly much longer between the last semigloss coat and the satin. Thank you so much, Tadas. God bless you for your willingness to help so many people! Hi Becky. Sorry for the late reply. Yes, you can add another coat to drop the sheen level. This can be done at any time as long as the floor is clean and has no contaminants. 4 coats will give you a nice strong finish. Commercial/restaurant flooring – we’re looking to install oak or pine floors (cost dependent) in our restaurant at the beach, so high humidity, sand and the building is over a crawl space and we’re thinking oil or hardwax oil. Obviously they take a beating from foot traffic, spills and cleaning (1-2 times daily), which finish would you recommend? Or should we look at 2-part water finish? How is that for long term maintenance? We don’t mind rustic look but have to be able to keep it clean! Thanks so much! Want to take a road trip to the beautiful Outer Banks of NC?? It’s hard to recommend a finish without looking at all the factors involved including the floors, setting and cleaning schedule in person. We have applied Magic Oil in a busy commercial/restaurant space and it has held up extremely well. It has some surface build and can be restored every six months with a new maintenance coat. This is what I would look into first. Loba only available from Germany. Do they ship to US? can you buy in the states..?? Yes you can buy it from floor supply distributors here in the States. I am having my floors re-finished next week and the highly rated company doing it is using Loba Ws easy Finish. I wanted oil, he convinced me this was the way to go. My concern was the waterborne products not making the grain “pop” like an oil based product. He claims that this product does make the grain pop and I will like it. I am now concerned that i need to stay with oil. I can’t tell when you wrote this so I am not sure if things have changed. I don’t want to stain and I don’t want dull floor. I also save $200 if I go to oil, but since the last finish lasted 14 years I really don’t care about the $200. I used the Loba Primer and two coats of Easy finish. I was very happy with the look, the grain did not go flat and the satin finish is what I wanted. There are scratches already and I have a stain from water sitting on the floor over night, I am attempting to get rid of the stain by refinishing that area and hoping for the best. I will also rebuff everything and add a third coat. I would suggest a sample section of each first so you know for sure. Especially for a decision that will last for 14+ years. You can use Natural colored stain too which will give you the look of oil with the benefits of water base. After the third coat didn’t have great protection, I ended up with the worst case option of re-sanding everything down to bare wood and going with an oil based finish. I am very happy other than the smell still hanging in there after two weeks. The first week was very bad. I’m a little confused by my quotes for Loba Easy finish. One provider recommends one coat of stain followed by 2 coats of Easy Finish. The second one says stain then 3 coats of Easy Finish are required. We are installing new hickory throughout the house. I would appreciate your opinion. I’m interested in using either loba invisible or ciranova hard wax oil magic for sealing lightly stained white oak trim to obtain a non yellowing and low sheen look. Would you recommend this and if so, which products? Floors are white oak finished with a loba oyster impact oil. Thanks! !